OCEAN TERRACE is luxurious, single family villa style home just a few minutes’ walk away from the expansive, beautiful sandy shores of Capistrano Beach. OCEAN TERRACE is ideally located between the Dana Point Harbor, downtown San Clemente, and the historic San Juan Capistrano. These coastal seaside communities offer numerous shops, restaurants and unlimited family activities. OCEAN TERRACE sleeps 4 comfortably in beds and 2 additional guests in a comfortable, queen size pullout sofa. It is quite spacious and large enough to host two couples or a single family. This home is also an entertainers dream as it will seat up to 16 people – a perfect location for any holiday, birthday, anniversary, or special event. The views and the oversized, tiered terraces are ideal backdrops to an engagement party or small wedding. Even though the garage isn’t available, this home can park 5 or 6 cars on the driveway as well as offering additional street parking. Or, maybe you’re in need of a more relaxing retreat and your intentions are to quiet your mind and mediate. Between the panoramic views from the expansive terraced patio in the backyard and the fully enclosed, lushly landscaped courtyard and other hidden spaces tucked throughout this home there are many ways to find that perfect peaceful place. BEDROOMS & BATHROOMS: This is a single story home. 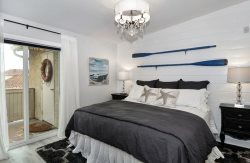 The master bedroom suite features a Cal King bed, mounted flat screen TV & separate dressing area with mirrored closets. The en suite master bathroom features all marble floors, countertops with dual vanities and a walk in shower. This bedroom is located in the back of the house. The bi-fold accordian style doors open up completely to the back patio to take in the amazing views and ocean breezes. The second bedroom features a queen size bed with large dresser alcove and flat screen TV. This bedroom also features french doors that open to the back patio. The second bathroom also offers marble floors, countertop, and shower enclosure. KITCHEN & DINING: This fully outfitted gourmet kitchen features higher end wood cabinets, granite countertops, tile backsplashes, newer appliances, and a large walk in pantry. This bright and airy space opens into the adjacent dining area featuring a large, glass table and chairs. FAMILY ROOM: This spacious open floor plan features comfortable couches, a fireplace, coffee table, and a large flat screen TV. Wi Fi and local telephone service is included. The bi-fold accordian style doors allows the back wall to open up completely to the back patio to take in the amazing views and ocean breezes. OUTDOORS: Two large, expansive tiered patios in the backyard with a large shade umbrella feature living room style outdoor furniture sets. On the north side of the home also in the backyard adjacent to the family room the bi-fold accordinan doors open to a large dining table with chairs offering the perfect setting for an ideal outdoor dining experience. The common area landscaping is maintained by a gardener who comes by once a week. MANAGEMENT: Very clean and professionally managed. Vacation Concierge is available 24/7 for any questions, issues or concerns that come up during your stay. SUITABILITY: Non-Smoking home / No pets. Must have an adult(s) staying at the house during the term of the lease. ATTRACTIONS: OCEAN TERRACE is just up the road from the O.C. Dana Point Harbor, Capistrano Beach, and downtown Dana Point. Located towards the southern section of Dana Point, it is just a short 15 minute drive into the beautiful and 'artsy' seaside town of Laguna Beach. It’s also convenient and within a short 15 minute drive (or a 30 minute bike ride for the more adventurous types) from the historic San Juan Capistrano where the Mission San Juan Capistrano and the quaint Los Rios District is surrounded with charming antique shops, restaurants, and art galleries. There’s even a petting zoo for the smaller members in your family! The city was named after the headland of Dana Point, which was in turn named after Richard Henry Dana, Jr., author of ‘Two Years Before the Mast’, which included a description of the area. Dana described the locale, including neighboring San Juan Capistrano, as "the only romantic spot on the coast". Although Dana described the anchorage as poor, it is now a developed harbor and contains a replica of his ship, the Pilgrim. The Pilgrim is used as a classroom by the Ocean Institute, which is located at the harbor. Come and explore Capistrano Beach & Dana Point at OCEAN TERRACE. We look forward to having you as our Guests!